Spending lots of time reading and browsing vintage cookbooks, sipping iced tea, and today…a bit of pre-autumn cleaning. The temperature only needs to dip below 70 and I start thinking school shopping, autumn road trips to our favorite spot on Lake Superior’s north shore, soup, bread, nesting…nesting…nesting. Are you like this? 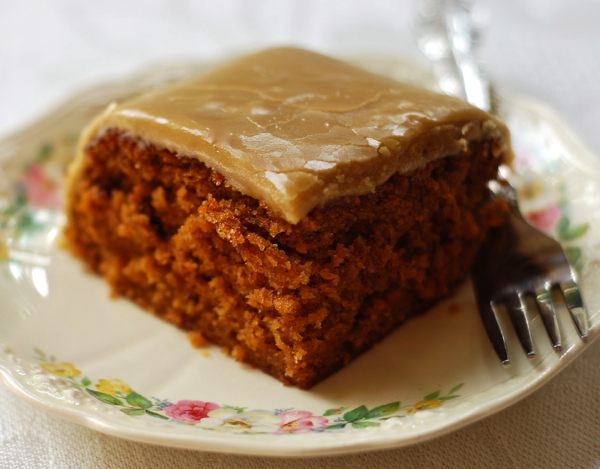 Anyway, I came across a very old recipe for a simple tomato soup cake with boiled caramel frosting during one of these late night recipe quests in my study. How interesting and unique! The perfect recipe to try and blog about, I thought. Oh MY. Am I ever glad I did! This is one of the best little cakes I’ve ever made. Moist, wonderful spice cake-like flavor. (No, it doesn’t taste like tomato soup.) And the frosting? Don’t even get me started. I want to marry the frosting. Mix the butter and sugar together until light and fluffy. Add the egg and soup, and mix well. Sift the flour, soda, salt and spices into the butter mixture. Mix until smooth and everything is evenly combined. Pour into a buttered 9 x 9 square, glass baking pan. Bake at 350 degrees F. until a toothpick comes clean when inserted into center of cake. (About 35 minutes.) It’s important to not over-bake this cake. Place all ingredients in a small saucepan. Mix well with a wire whisk. Bring to a boil, stirring constantly and allow to boil for one minute. Remove from heat and continue whisking while the frosting cools and becomes thick. (5 to 10 minutes.) Pour over cake, and working quickly, smooth over surface of cake until it drips down the sides. i am totally trying this and while i will have to veganize it i think it will work. i am envisioning a rainy cool day with a cup of tea and a good book. Thanks for posting! You grabbed my attention with this one. What a treasure. It sounds crazy and delicious. Definitely will have to give it a try. Thank you for sharing. Thank you so much for this recipe. While my granddaughter is visiting me we shall make it together. Will be a good memory. Funny, the directions don’t indicate when to mix in the soup. LOL I’m a baker so it didn’t deter me. Cake is in the oven now. Thank you for the recipe. Will try it Monday for my granddaughter who is visiting. I add raisins and nuts to my tomato soup cake, and it use a bundt pan, I usually use a cream cheese frosting, can’t wait to try this boiled one u posted !!!!!! We call it the mystery cake, no one ever guesses the tomato soup ingredient !!!! This cake is sooo good !!! My great aunt used to make this all the time. Thank you for finding it and to everyone …. make it , it won’t disappoint !! Melissa I made your cake. And would like to make the icing but I only buy 2% milk Will my icing still be okay 🙂 ty for your time . What ‘flavor’ does this cake have? Hi Teri 🙂 This cake tastes like a very rich spice cake. Enjoy, and thanks for stopping by. I have been looking for a recipe for Tomato Soup Cake for years!!!! I had eaten it a long, long time ago. Thank you so much. Hi Carole! I’m so glad you like the recipe! Thanks for visiting 🙂 Enjoy! my mom made this so yummy. I want to give a try with gluten free flour to male cupcakes. My “Memere’ use to make this when we were kids. But she would make cream cheese icing to go with it. Amazing. Going to try it with this caramel icing. Looks so yummy. Thanks for sharing. Hey! Couldn’t find condensed tomato soup here in India! Will fresh soup work? I remember as a child, 60 years ago,my grandmother (who emigrated from England) made this cake. Loved it then and am glad to find the recipe. Thanks for posting . I make a Caramel frosting but I use butter, white sugar, condensed milk, evaporated milk, and I add a cap full of vanilla to it!! It’s the best frosting ever! I’ve always put it over chocolate cake with holes poked in it so the hot frosting gets into the cake! My mother has made this for us growing up and since my daughter and myself have kept it up! Going to have to try on your cake recipe! Love Carmel frosting …would you share your recipe for your Carmel frosting…how much butter, white sugar, condensed milk, etc. ? Haven’t had this in years. Mom used to make it often but she put 1/2 cup of raisins in hers. This is my all time to die for cake. Anyone making a birthday cake for me this is it. I put raisins in mine. Love,love it. to make a bigger cake. Yum Yum! Just saw this recipe, sounds very good. How long do you leave in pan, or do you pour frosting over cake in pan? How will it drip down the sides? Do you think it would work with Robin Hood Gluten Free flour? I tried this yesterday and it was a hit! Put some pecans in too, and divided the batter between two smallish cake tins. One small note: The icing was still very runny when pouring it on after 10 mins, and even seeped into the cake. I left half of the icing to sit for a few hours and it thickened up to a much better consistency for spreading. It’s also very sweet, so next time I’ll serve it with whipped cream or a low-sugar cream cheese frosting. Melissa thank you so much for your Delicious recipe.. Also using 2% milk for the icing was not a problem… YUMMALLICIOUS!!!! Do you know how many calories, carbs, proteins, and sugars are in here? I couldn’t get my icing to thicken at all. Looking at other recipes a lot of them call for powdered sugar. Is that missing from the recipe? Frost it while cake is just out of the oven or after it cools? Copyright © 2019 ChinDeep. All Rights Reserved.